In a Nutshell – We go to great lengths to find our musical prodigies and five star athletes. Why not do the same for those with the best chances to grow a successful business? Are great innovators born or taught to succeed? The question has been bantered about in university halls and meeting rooms for decades. It’s generally recognized that ultra-successful business owners have personality traits that make them unique, yet quantifying these characteristics has never been easy. Author and CEO of Gallup Jim Clifton knows all about global trends and America’s need to create jobs. His book The Coming Jobs War, published in 2011 highlighted how jobs and employment will be the world’s most valuable commodity in the coming decades. Armed with Gallup’s arsenal of behavioral research and polling information, Clifton’s latest effort, Entrepreneurial StrengthsFinder digs deep to find those traits one needs to build and sustain an impactful business. The book is also one in of the successful books in the StrengthFinder franchise. Now Discover Your Strengths, a bestselling book in the series, presented an online assessment which enabled readers to identify which of 34 different human traits they were most proficient at. The overall message was that by focusing on the areas we are good at we can grow much faster and achieve much more than trying to slowing improve in the areas we are weak in. The same strength finding concept can be applied to the self-employed who need to hire or contract out to strengths that compensate for the areas they are week in or managers that seek to build a team with complimentary skill sets. 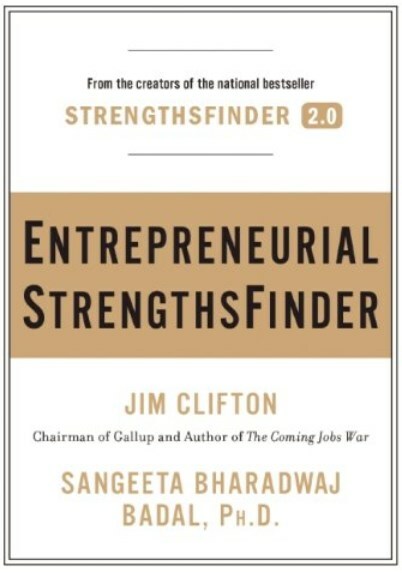 In Entrepreneurial StrengthsFinder, Clifton teams up with Sangetta Bharadwaj Badal, a primary researcher at Gallup’s Entrepreneurship and Job Creation Initiative. Badal took previous Gallup and StrengthFinder research worked for several years to develop a short test that measures 10 talents of success entrepreneurs. Clifton is quick to point out the distinction between entrepreneurship and innovation. An entrepreneur is driven to act and to build, while an innovator is “a problem solver with a deep passion for improving something”. The inventor may have the new idea but the critical role is taken up by the entrepreneur who creates the business to sell that idea. It’s important to remember that much of the emphasis of this entrepreneur identification has to do with how the personality of an entrepreneur not just influences how a solid idea comes to fruition, but how that personality affects the longer term growth and survival of a company. The entrepreneurial version of StrengthsFinder comes with its own unique assessment, which is available for free with the purchase of the book or through the company web site. After taking the assessment, participants are ranked for their strengths as the following: Business Focus, Confidence, Creative Thinker, Delegator, Determination, Independent, Knowledge-Seeker, Promoter, Relationship-Builder, and Risk-Taker. The assessment is the key component of the book. While most readers will want to see how their own strengths align, the Clifton emphasizes that the tool should be used for identifying young students who have the makeup high level innovators. Clifton firmly believes that many young entrepreneurs are passed over in our present education system and their huge potential never realized. Imagine if we sought out the skills that highly successful entrepreneurs possess the same way we try to identify musical prodigies or five star athletes. Identifying the specific traits of a person who can take an innovation and change the world is the main message of this concise but important book. Chris Wendel is an author and business consultant as well as a commercial lender with Northern Initiatives, a community development financial institution based in Marquette. Wendel lives and works in Traverse City and can be reached at cwendel@northerninitiatives.org. This entry was posted in Uncategorized and tagged Book reveiw, entrepreneurial. Bookmark the permalink.